Amah is about 13 years old. He loves to laugh-- his smile brightens the room. 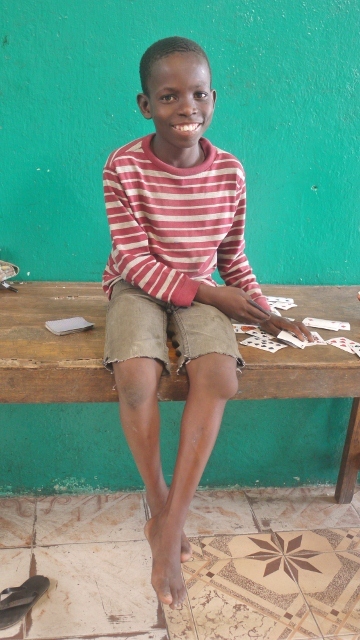 He loves to play card games or soccer with his friends at the orphanage where he lives. He has a tumor growing on his knee. Multiple doctors that have examined him concur that the only viable treatment plan for him is not available in Liberia. Best case scenario he will need a series of surgeries to remove the tumor from the bone and rebuild his leg. Worst case-- full blown cancer treatment. Either way he is looking at long-term treatment, and ongoing follow-up care. The best option for Amah at this point seems to be adoption. 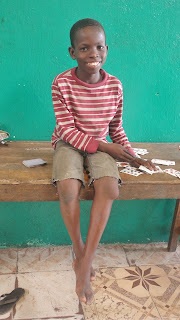 I am NOT writing this blog in search of an adoptive family for Amah. Several families have already come forward with interest and I am hopeful that one of those will be the perfect match for him. I am writing this blog to ask that you pray earnestly with me for Amah, for Amah's new family and for me as I try and facilitate this process. This is not a small thing. A lot has to fall into place for Amah to get to the states and his medical care can not begin until he gets there. I am confident that our God, who created Amah, and knit him together, can and will make a way for him. I Wish Amah a happy life and pray for his beautiful smile. May he get well soon. God bless !